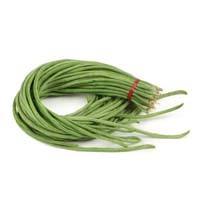 Long beans contain high fiber. Therefore, long bean is very good to be consumed by people with diabetes. Another benefit is smooth bowel movements and lower cholesterol levels. The content of nutrient of long bean include beta-carotene, chlorophyll, vitamins B1 and B2, fiber and pectin. Vegetables are useful for controlling blood sugar levels, treat hypertension, minimizes the risk of stroke and heart attack, improve the functioning of the digestive organs, reducing the risk of cancer and help overcome constipation.